Eat coz tommorow you may die-T: Yum! The title of this post is inspired by a talk I heard this morning. The Managing Director of Yum Foods(the group that owns brands such as KFC, Pizza Hut and Taco Bell) addressed us at work this morning- a very inspiring speech, related to good food(my kids would vouch for the brands) and I decided that I just had to get back to the blog. It has been a long break- over two months. I have been cooking, trying out new recipes but have somehow not managed to click pictures or write about them. So back from the break with my favorite theme, " one dish meals". And though I hardly eat rice these days I think our very own "desi pulao" tops the charts when it comes to one dish meals. And thanks to the pressure cooker/rice cooker the pulao gets done in a jiffy too. So full marks on nutrition, taste and convenience. And while the rice gets done and the cooker cools you assemble the raita. Perfecto! If you are making a veggie pulao you can team it with a plain raita( dahi to which a wee bit of sugar, some black salt or chat masala and bhuna jeera has been added or maybe if you are feeling a little more indulgent then a dahi boondi). And I never fail to get amazed by the number of different types of Pulaos/mixed rice that can be prepared. From the basic jeera(cumin) rice( now this goes well with an elaborate dinner, as a substitute for steamed rice- looks and tastes way better), to the peas pulao( Jeera rice to which you add a handful of shelled green peas- no extra effort, frozen green peas have a permanent place in the freezer- I know of families in Delhi who painstakingly shell peas during the Winter months, then blanch and store them in small single serve zip lock pouches and use it through the year. For those of you who don't want to go through the trouble there is always the Safaal peas). Sorry I got a little carried away. And then of course the regular vegetable pulao and variations therefore like vegetable pulao with tomato, vegetable pulao with paneer, the one Maharashtrians make with goda masala, the traditional vegetable pulao with kaju(cashew), kishmish( raisins)- this one used to be a regular at all family weddings. The list is actually endless and over the next two/three weeks I plan to try out a couple of new types. So watch this space for more. The pulao I made this evening has just one added ingredient which sets it apart from the regular ones- green corriander( hara dhania) ground to a fine paste with ginger, garlic and green chillies. 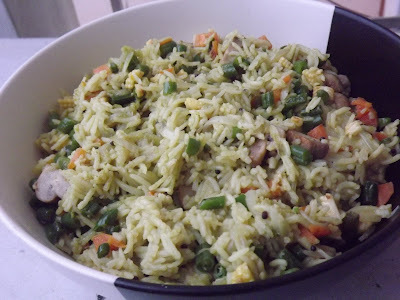 Gives the pulao an unusual green colour and a really flavorsome taste. Gets done in under 10 minutes and goes well with a regular raita. As the vegetables are cooked and added separately there is no fear of them getting over cooked or the pulao turning lumpy. I think this pulao would taste really good on cold winter evenings with seasonal vegetables like cauliflower, carrots, beans etc. Mixed vegetables, finely chopped: 2 cups( I used beans, carrots, mushroom and baby corn). Water: 2 cups( prefferably warm water as that prevent the rice from sticking to each other and you get a nice fluffy pulao). Heat 1 tsp oild and stir fry the vegetables with some salt and keep aside. This should not take more than a few minutes as they would have been chopped fine. Next heat the oil in a pressure cooker. Add the mustard seeds, once the mustard sputters add the onion and fry for a minute or two. Next add the curry paste and saute till the raw smell of ginger garlic is no longer there. This should take a few minutes. Add the water, close the lid of the pressure cooker and let it give out one whistle. Take the cooker off the flame and let it cool down. Open the lid and add the vegetables, mix well. Serve with a cucumber, tomato, onion raita. I loved the spicy taste which got perfectly balanced with the raita. However if making it for young children I would recommend you skip the green chillies. There are two new interesting dishes that I have made today. Yes, happy to be on an overdrive. Hope to blog about them soon. Writing about them makes cooking a lot more fun. And making everyday dishes blogworthy is even more fun, you invariably try harder. Till then, Bon Apetit and Happy Cooking!